Connect your iPod or iPhone to your car or home stereo, portable speakers, or sound card This innovative cable design from Belkin makes it easy for you to listen to music from your iPod or iPhone as you drive. 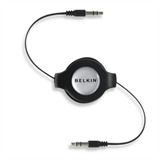 It also connects to the mini-stereo jacks on other portable audio equipment, such as your CD and MP3 players, home stereos, portable speakers, and sound cards. The flat design winds the cable neatly inside the reel, eliminating the hassle of tangled cords. Now you can control your cable length when connecting portable audio devices.